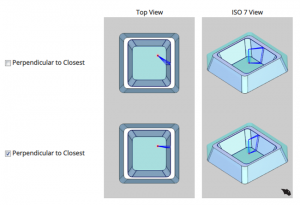 Tech Tuesday is a weekly blog that addresses some of the most common questions and concerns that I hear throughout the previous week from users of BobCAD-CAM software. Both customers and future customers are more than welcome to leave a comment on what they would like to see covered for the following Tech Tuesday. Enjoy! With the release of Version 31, many people are asking the same question… What’s New? Starting with our Wire & posting enhancements, let’s take a look at what people can expect from our latest CAM software. 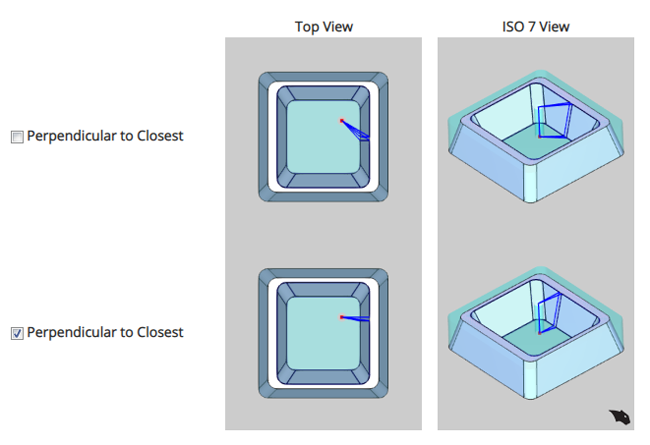 If you are cutting with a Wire EDM machine, typically, the start point is known and the user wants to go straight (perpendicular) from the start point to the closest entity. 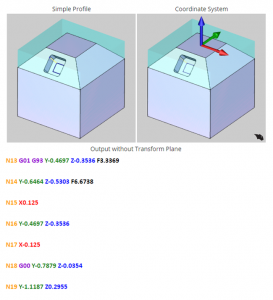 In past versions, BobCAD gave users the ability to choose a specific point to start from. The drawback? The next location to go to was always the beginning of the selected chain, which may or may not have lead to a perpendicular cut from the start point. This meant that users had to spend some more time in CAD until they got the desired results. In V31, the new Perpendicular to Closest option is available when using the Select point lead option. This means that you can now, regardless of the geometry’s start point, choose an option to get to the quickest path to cutting your geometry. We put a lot of attention on the Milling posting engine in order to optimize the code output for 4 & 5 Axis posting. We also gave you the ability to control your coordinate output modes depending on whether you’re using standard machining, indexing/positioning or simultaneous machining. 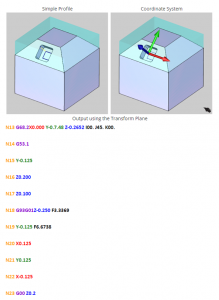 Each controller varies and may use a different name for it, but whether you call it Tilted Work Planes, Transform Planes, Slope Machining or whatever else, what it does is shift the work coordinate system to make things possible which, otherwise, wouldn’t be. For example, drilling canned cycles can’t be output if the tool doesn’t align with the Z Axis of the coordinate system. 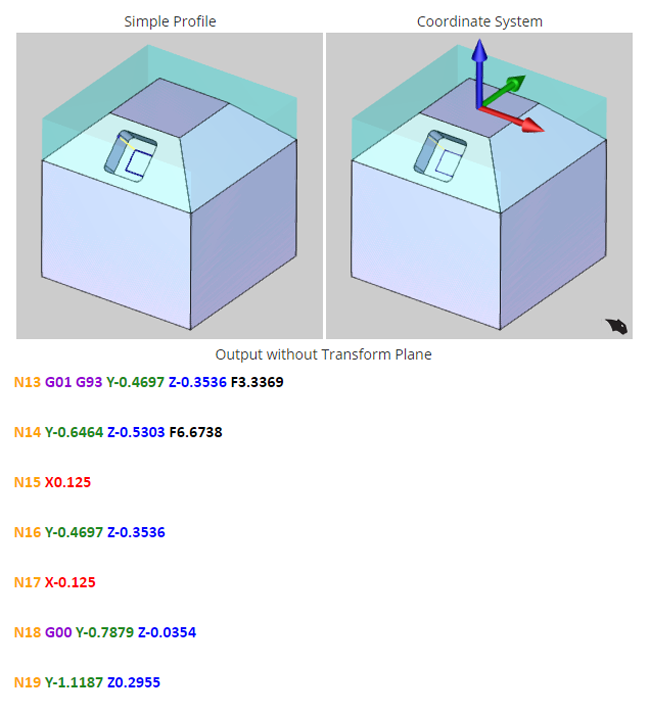 Using a Transform Plane allows us to shift the coordinate system to make this possible. Usually, when an operation is being done on an indexing system, most controllers can’t use machine compensation. Tilting the coordinate system allows the controller to tell exactly where to place the tool to compensate correctly. Often, machinists need to make on-the-fly adjustments to the job, so it’s good to be able to look at the code and know what to expect. This can get pretty difficult when working with jobs that aren’t completely flat. Simple coordinates can turn complicated real quick, Our sample part below has a simple profile, but, when done on an index system can have some confusing X, Y and Z coordinates. What a mess. 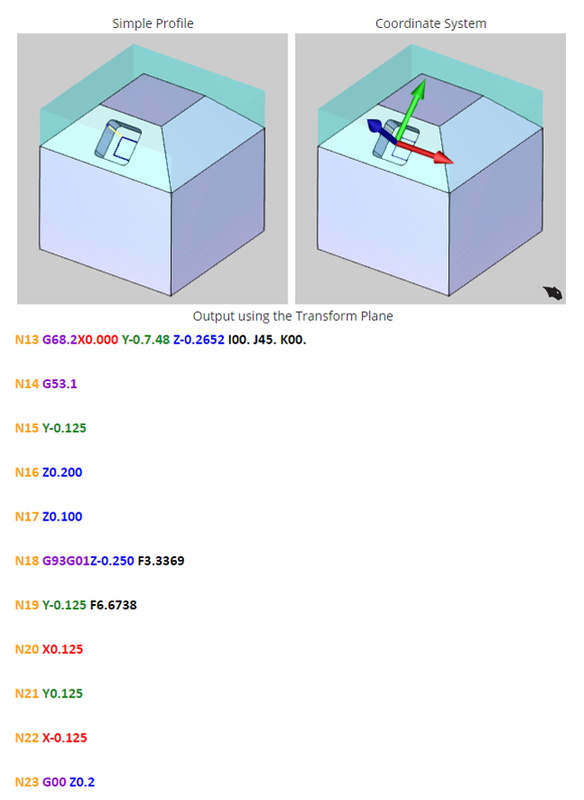 Now, let’s look at how easily that code can be read and updated using a transform plane. Our Multiaxis Posting page’s Move List Writer gets its Move List Coordinates group upgraded in the new V31 CAM software. Move List Coordinates now offers users the ability to have different settings for Standard, Indexing/Positioning and Multiaxis Simultaneous Motion outputs. Coupled with the available setting in V31, we are proud to offer Origin Tracking. Thank you so much for reading yet another Tech Tuesday; see you next week! With the release of Version 31, many people are asking the same question… What’s New? Starting with our Wire enhancements, let’s take a look at what people can expect from our latest Wire EDM module in V31.